No matter what bank of the river you’re on in Guntersville, you’ll find the best appliance repair service right here at Appliance Masters Repair Service. We pride ourselves on giving this city the best service we can, no matter the major brand of appliance that you may have. This Marshall County city has access to the best fishing, boating, and watercraft in all of Alabama, and it now has access to the best appliance repairs, both large and small. Give us a call today to take advantage of our low cost $75 service charge no matter if you call Monday morning or Saturday evening. 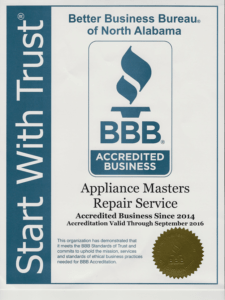 Why Are We the Best in Appliance Repairs in Guntersville? It could be because we service every major brand. We handle Maytag washers, Whirlpool dishwashers, Sears brand appliances, and nearly every other major brand. We handle all the small appliances as well from microwave oven repairs to any GE small appliance repairs. You’d be surprised at just how knowledgeable we can be of your brand. As for knowledge, we have over 20 years of experience in the industry. We’re familiar with every make and model, fad and fashion, and brand and build of appliance over the last two decades. We know your Frigidaire as well as your Kitchenaid. We work hard to pass that knowledge and expertise on to you so that you can have the most experienced and most trustworthy technician at your door when you need it most. We offer a great timely service as well. Our hours are suited to fit your schedule. We can work 9AM-9PM, 7 days a week. That means that regardless of what time you’re free, we can work around your schedule to fix any problem appliance you have. Even if you’re spending some time out fishing on Lake Guntersville on Saturday morning, we can be at your house that evening to suit your convenience, not ours. Our commitment to you means that we’re the most accessible appliance repair service in Northern Alabama. As for commitment, our personal guarantee is to provide with a service you’ll love. In fact, we’re not happy until you are. That’s why we always base our success on whether the customer is satisfied. Over the last 20 years, we have had many successful appliance repairs, and they all come from extremely satisfied customers. How Do You Get the Best Repairs? We’re ready and waiting for your call. You might need just a basic service, or you could have an emergency oven repair that can’t wait any longer. We’re happy to accommodate with prices you’ll agree are the best you’ll find in all of Guntersville. Our affordable appliance repair also comes at no extra cost to you, so you can have the confidence to call whenever you need. Make us your first choice to get access to the best appliance repairs in all of Marshall County.